NEW ORLEANS (CNS) — They stood out because they stood together, employing the wisdom of young parents, in the back of a hotel ballroom packed with 2,800 permanent deacons, their wives and children. Jeremy Tickle and his wife, Andrea, who met in Atlanta, married in 2015 and moved to Birmingham, Alabama. 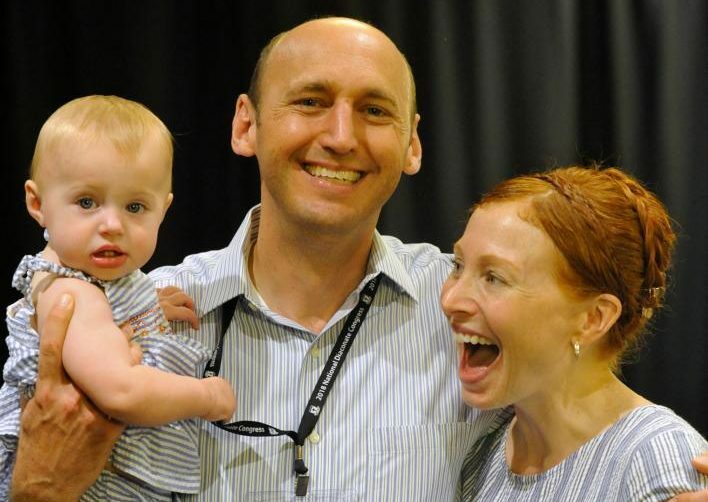 Two weeks ago, they brought their 9-month-old daughter, Chrysalis, with them to the 2018 National Diaconate Congress in New Orleans. Jeremy, 43, is not yet a permanent deacon. In fact, he has advanced only to the inquiry phase in the diaconate program of the Diocese of Birmingham. But the Tickles felt compelled to come to the national conference in New Orleans to learn more about the diaconate ministry that one day may be a part of their lives. “I have been discerning for a long time a potential call, even before we met,” said Jeremy, a real estate agent who was baptized Catholic but raised in the Methodist church before going through the Rite of Christian Initiation of Adults process and entering into full communion with the Catholic Church in 2012. A short time later, he made a pilgrimage to Rome and listened to Pope Francis deliver his general audience at St. Peter’s Square. “Those two deacons who were helping me understand the healthy dynamics I was seeking helped me in my spiritual development and brought me closer to God and Our Lady, and my faith developed very, very rapidly,” Andrea said. “These two deacons had grown children — they were much older — but I realized that these (kind of) men are out there, and I am going to marry one. I am not going to settle. “I am going to find someone who is good-hearted like this, who wants to be a servant in this way, who has a servant’s heart. And that is, to a ‘T,’ what Jeremy has,” she added. The Tickles understand that the diaconate formation suggests a couple be married for at least five years and already have children. Jeremy said the initial inquiry phase has given them both a chance to reflect on the vocation. Coming to the national congress was a chance for both of them to investigate further. The Tickles took their honeymoon to Rome and wore their wedding attire to a papal audience, where they got to meet briefly with and received a blessing from Pope Francis. In a big crowd in New Orleans, the Tickles have been the center of attention.